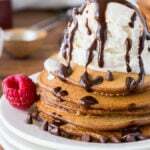 If you’re a pancake lover, then you’re going to want to listen up! I just got my hands on this amazing cookbook called Stack Happy, featuring 70 delicious pancake recipes. 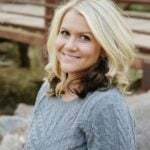 My friend Karly Campbell is the author and creator of the book, and she also has an amazing blog, Buns In My Oven too! 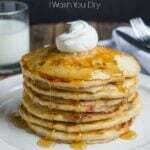 Her cookbook is full of everything from classic pancake recipes to dessert pancakes and even savory style pancakes! 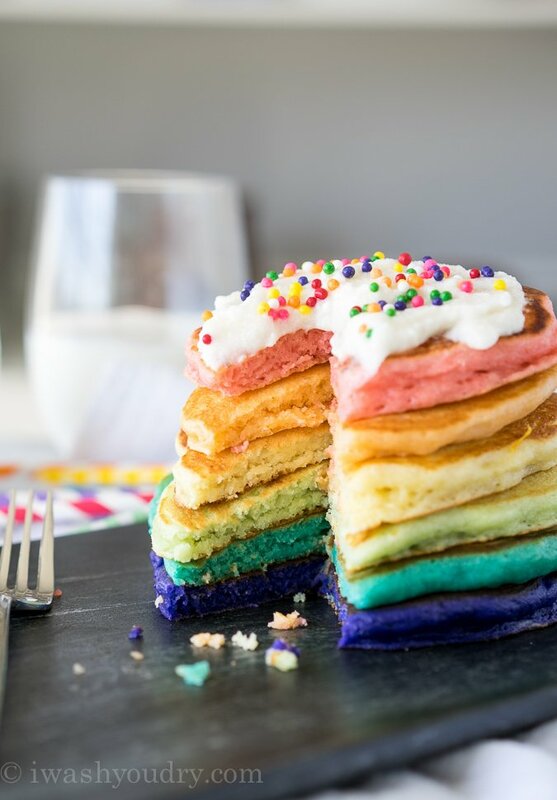 There really is a pancake recipe for everyone! 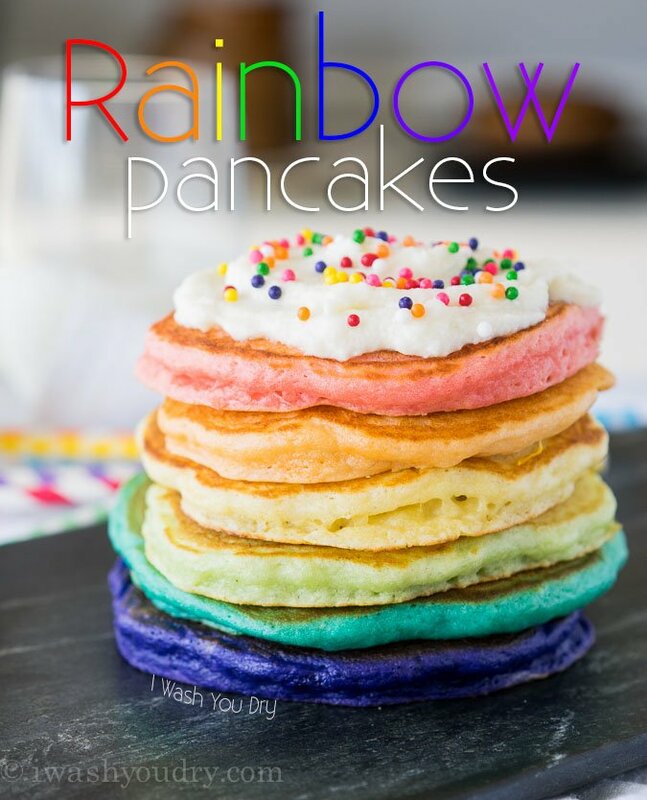 As soon as I flipped through the book my eye immediately caught hold of these amazing Rainbow Pancakes! 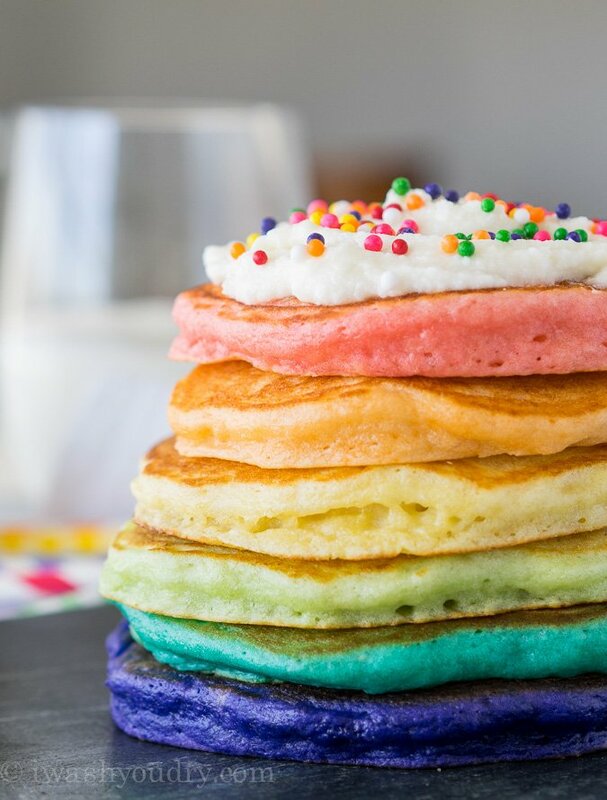 What I thought was super neat was that these pancakes are actually flavored and colored with gelatin powder!! First of all, the pancake batter was super simple to whip up. It was light and airy and I knew it was going to make some amazingly fluffy pancakes. My kids loved helping me separate the batter into 6 bowls and mixing in the gelatin powder. The smells were awesome! In the book, Karly does suggest adding a few drops of food coloring to enhance the colors. The first one we mixed up was grape (purple) and it was really light in color, so I added… ahem… way too much purple food coloring. oops. Then came the blue, and I added just a drop or two. The rest are just colored with the gelatin and I love the subtle hues that they produced. If you’re looking for ultra light and fluffy pancakes, these ones are definitely a winner. Karly talks about how much she loves the super puffy pancakes, and the key to making them that way in her cookbook. I’ve had her book sitting on my counter for a few weeks now and every time someone comes over to visit they immediately grab the book and start flipping through the pages. It’s gorgeous photography and mouthwatering recipes make this book a non-stop page turner. 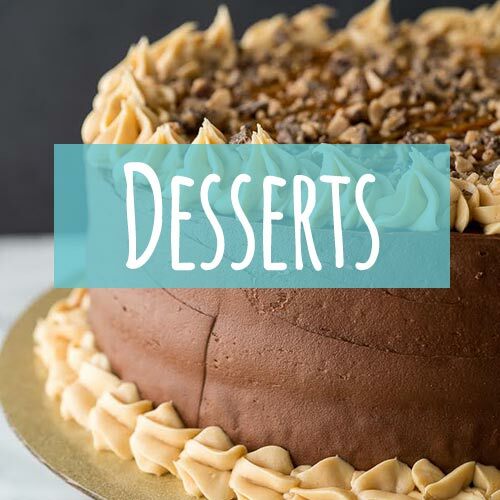 My kids have already picked out several recipes for me to try over the next few weekends, and I have several recipes I’m dying to try as well. 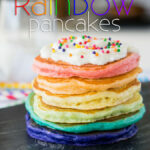 These Rainbow Pancakes were a huge hit with the kids. I especially liked the fluffy frosting that went on top! How fun would these be for dessert on St. Patrick’s Day! Now that’s a rainbow I’d love to chase! 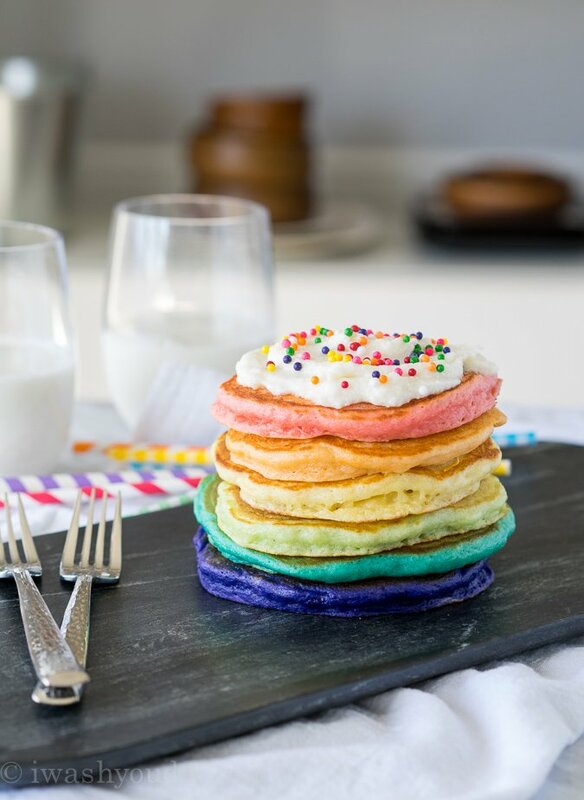 Rainbow Pancakes are fun and delicious way to change up your regular old pancakes! In a small bowl, mix together the buttermilk, eggs, oil and vanilla. If you’re making one color and flavor of pancakes, stir the 1/4 cup of gelatin powder into the pancake mix. 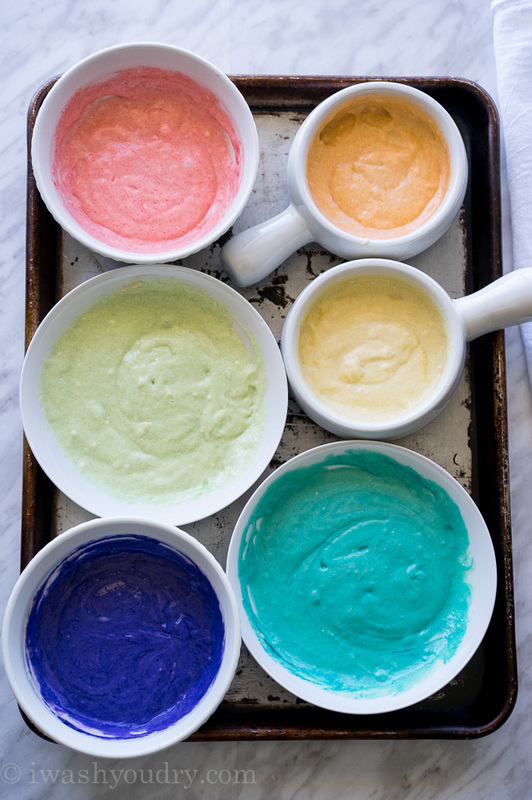 If you’re making rainbow pancakes, place 1/2 cup of batter into 6 separate bowls. Stir 2 tsp of one flavor of gelatin powder into one bowl. Repeat with the remaining flavors and colors. Spray your cooking surface with nonstick cooking spray and place 1/4 cup of the pancake batter in the pan. 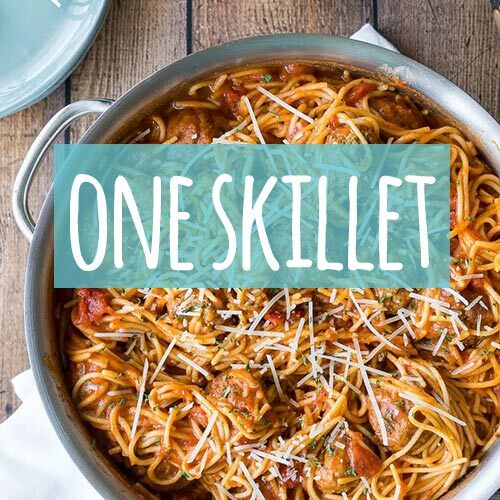 Cook for 3 minutes per side or until cooked through. Repeat with remaining pancakes. Beat together the butter and vanilla with an electric mixer until creamy. Gradually beat in the salt and powdered sugar until well combined. Add the heavy cream, a little at at time, to reach the consistency you desire. Spread frosting on the pancakes and serve. You can purchase Stack Happy on Amazon! disclosure: This post contains affiliate links. I was provided a copy of Stack Happy for free, but was not required to write a post about it. All thoughts and opinions here are 100% my own. They are so cool! My two boys would love these. They sound quite easy – I’m in! Oh my gosh, Shawn! These photos are just stunning!! I absolutely love them! Oh my! 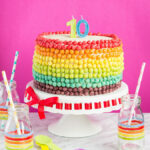 These look like so much fun to make. I don’t have any kiddos in my house, but I could see myself having way too much fun with the colors. 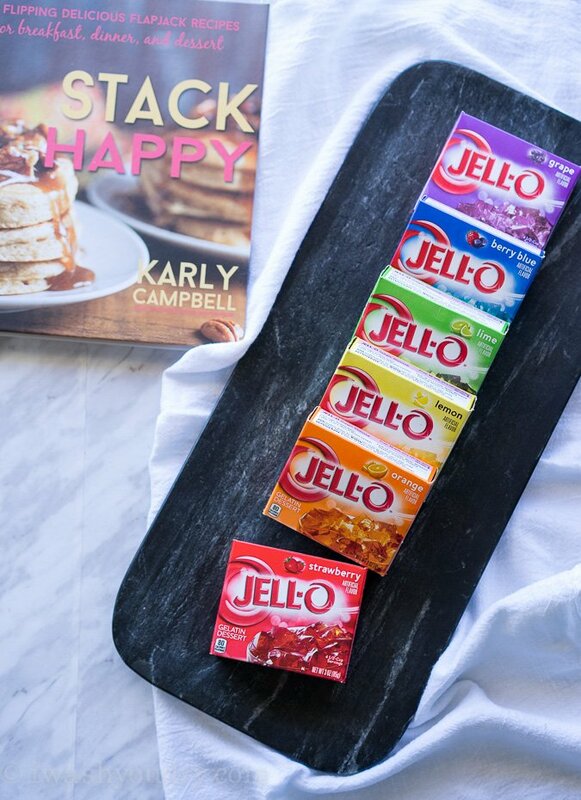 Do the pancakes soak in the flavors of the jello, or is it mostly for color? I adore the blue and purple ones! The jello does flavor them slightly. I imagine if I used more of the gelatin powder the flavor would be more apparent, but I don’t know how the texture would be at that point. the pancakes don’t give up taste for the fun part.